Over the previous decade, there had been the odd rap hit on the Australian chart. From Blondie's "Rapture" (number 5) and "The Message" by Grandmaster Flash & The Furious Five (number 21) in the early '80s to Run-DMC's rap/rock hybrid, "Walk This Way" (number 9), in 1986 to "Push It" by Salt 'n' Pepa (number 3) and Tone Lōc's double whammy, "Wild Thing" (number 15) and "Funky Cold Medina" (number 8), later in the decade. But, what had so far eluded the genre was a chart-topping record. The closest a rap song had come to reaching number 1 on the ARIA top 50 was in 1988, when Morris Minor & The Majors' novelty hit, "Stutter Rap", peaked at number 2. In 1990, a rapper with a penchant for baggy pants released the song that would finally take the genre to the very top - and it debuted this week that year. Before "U Can't Touch This" could climb to number 1, we were still stuck with Heart at the top of the singles chart, as "All I Wanna Do Is Make Love To You" maintained its position for a third week. Their big European hit, "Got To Get", had been bouncing around the ARIA top 100 since April (and will eventually turn up as a breaker), but this follow-up from the Swedish duo - although a bigger hit at home for them - was no more than a chart footnote locally. 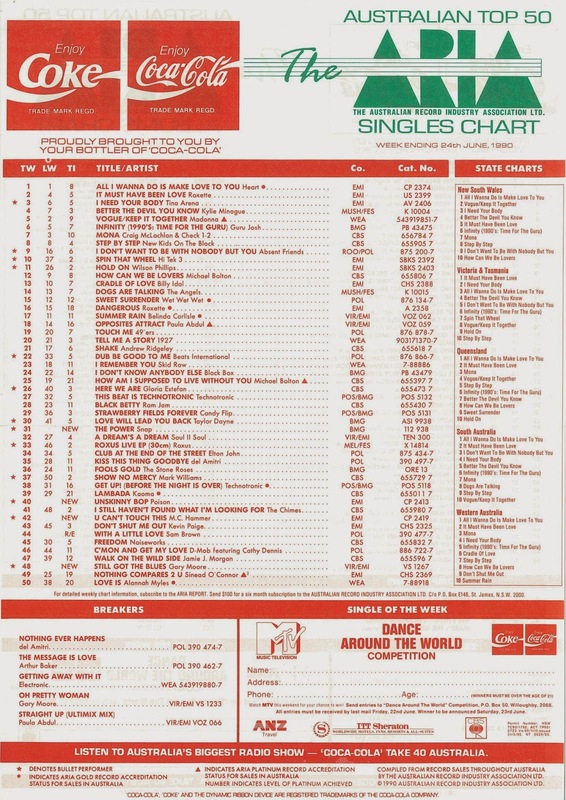 In my 1985 posts, we recently saw a top 50 miss by F.A.B. which had been produced by Eddie Rayner. Here's the band the ex-Split Enz keyboardist went on to actually be a member of - but despite having a big sound (and video budget), it also tanked. Not even a cover of this Etta James classic could change Sydney's chart fortunes in Australia, with it becoming his third European hit to miss the local top 50. The original version of her breakthrough single had only managed a peak of number 27 in Australia, which in theory meant there was plenty of room for improvement. And so, a reswizzled version of "Straight Up", taken from Paula's remix album, Shut Up And Dance, was released in the hopes that it'd benefit from her raised profile in the wake of "Opposites Attract" and storm the top 50. More a light drizzle, as it turned out. While previous single "Oh Pretty Woman" had been slowly making its way up the top 100, registering as a breaker again this week, follow-up "Still Got The Blues (For You)" crashed straight into the top 50 on its way to give the singer/guitarist the biggest single of his career in Australia. Beating the number 25 peak of his 1987 remake of "Friday On My Mind", "Still Got The Blues..." was also the (kind of) title track of the most successful album of his lengthy career, which reached number 5 in Australia. Some of the cash he earnt from this release would end up having to be paid to German band Jud's Gallery, who won a plagiarism case against Gary when they successful claimed the riff of this song was too similar to one found in their 1974 track "Nordach". Can't hear it? Try this comparison. 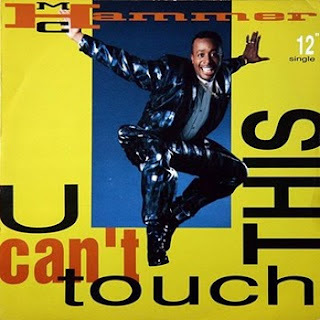 By 1990, MC Hammer (real name: Stanley Burrell) was already a big deal in America - the two American Music Awards you see him winning at the start of the "U Can't Touch This" video are for his 1988 album, Let's Get It Started. But in Australia, he was an unknown. That all changed with the release of the first single from the all-conquering Please Hammer, Don't Hurt 'Em. Taking its hook from "Superfreak" by Rick James (which reached number 26 in Australia in May 1982) - and actually giving credit for the sample - "U Can't Touch This" quickly became the first rap song to top the Australian chart. Of course, only a few weeks earlier, a short rap had featured on a number 1 single, pop smash "Opposites Attract" by Paula Abdul - and "U Can't Touch This" shared more in common with that than, say, the singles by Public Enemy or N.W.A. that had infiltrated the lower end of the top 100 so far in 1990. With its recognisable hook and quotable lyrics, not to mention Hammer's instantly iconic dance routine and trend-starting trousers in the accompanying music video, there was no way the song wasn't going to be massive. Last seen on the top 50 just over a year earlier, Australia's second favourite hair metal band (after Bon Jovi, of course) returned to the chart with this first taste of their third album, Flesh & Blood. Eclipsing anything they'd released before, "Unskinny Bop" became Poison's highest charting single in Australia - even if the chorus lyrics were nonsensical. But the times, they were a-changin' and as rock took a more serious turn in the '90s, the days were numbered for a band that released meaningless party anthems. Good time-lovin' Poison would never see such chart heights again. Number 31 "The Power" by Snap! Besides landing themselves a big Australian hit with their debut single, German act Snap! shared another thing in common with other dance success stories Technotronic and Black Box - the female singer in the video did not perform on "The Power". Yep, Jackie Harris (who you can see in the screen grab below) was miming to the vocals of Penny Ford, who would eventually become a permanent member of Snap! along with rapper Turbo B (real name: Durron Butler). Speaking of Turbo B - although he can be heard in this version of "The Power", the song was first released in Europe by Power Jam featuring Chill Rob G, since the original rap was taken from the American MC's song "Let The Words Flow". Like the "I've got the power!" hook (lifted from Jocelyn Brown's "Love's Gonna Get You"), use of the rap wasn't cleared and so Turbo B was hired to perform an updated one for worldwide release. Not complicated enough? The two men credited as being the masterminds of Snap! (which is what Power Jam morphed into), Benito Benites and John "Virgo" Garrett III, don't actually exist. Instead, Benito and John are the pseudonyms of Michael Münzing and Luca Anzilotti respectively. That all settled, Snap! would go on to become one of the biggest dance acts of the early '90s. Next week: the UK's best ever soccer anthem manages to cross over in Australia, plus the hairiest band in rock return and one of this week's new entries is joined by a second track by the same artist. I didn't actually hear 'Rok the Nation' until a few years ago. My local K-Mart thought it was going to be big though, and ordered in many copies. I don't remember The Makers or 'Big Picture' at all. I finally heard Adeva's debut album in full a couple of months ago, and was surprised to see that the original LP version of 'Beautiful Love' has the same backing track as Sydney Youngblood's 'I'd Rather Go Blind'. I wonder which came first? I think 'I'd Rather Go Blind' also had a combo-pack - being sold together with 'Sit and Wait' and 'If Only I Could'. I thought the remix re-issue of 'Straight Up' was a strange decision, given that its original #27 peak fared much better than all of the other non-'Opposites Attract' singles lifted from it. It seems to be an Australian-only release too. I bought the cassingle, which was selling for the maxi $6.95 price - no doubt a factor in hampering the reissue's success. 'Still Got the Blues' seems to steal the chord sequence more than the guitar riff on those tracks, to my ears. Such was my chart/rage interest that I woke the house up at 5:30 the Saturday morning this chart aired on rage, when staying with my grandparents that weekend (the volume on their TV was still set at a high level). They must have thought I was barmy. To make matters worse, 'U Can't Touch This' was airing (as a new release before the top 50) when I switched the TV on, during the intro part of the video where the audience is cheering loudly at the American Music Awards. I liked 'U Can't Touch This', but one thing I didn't like about it was that it seemed (to me anyway) to herald an increasing US (rather than UK) influence on the Australian charts, with rap gaining in popularity. I didn't know 'Superfreak' back then, so it seemed like a completely new/original track to me. I always wondered what 'Unskinny Bop' was meant to mean - well I think I know what it does, but why call it that? I don't understand why Snap! didn't use Penny Ford as the frontwoman from the get-go. Unlike some of the other real-voices, her look wasn't 'unmarketable'. I had no idea than an earlier, non-Snap! version of the track was released. Listening to it now, the rap between 2:05 and 2:08 was used for the mid section of Rage's 'Run To You'. So much recycling!